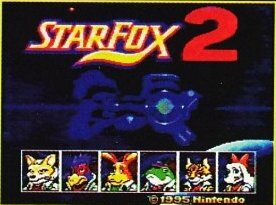 Star Fox 2 (or StarFox 2), one of the most anticipated games late in the life cycle of the SNES, was quietly cancelled by Nintendo in late 1995 with the impending release of the Nintendo 64. In 2002, a nearly complete prototype of the game was leaked on the Internet by an anonymous former employee, and has become the most well known unreleased game for the Super NES. On September 29th, Nintendo will finally release the final version on the Super NES Classic Mini. Thanks to TheRedEye and Retromags for the magazine scans, Psy_Commando for tipping off on the Super Game Power build, and Luigiblood for assembling the source code for an additional binary! Star Fox 2 is arguably the most infamous unreleased video game. Prior to the leak of a relatively complete prototype of the game, people always wondered what it could have been like. Even after the leak of the so called "final beta" version, it was clear that there was still more to be seen. I asked Dylan Cuthbert on Twitter several years ago, and he said many of the strategic elements were absent from version that leaked out. In 2017, we will finally be able to play this gem of a game in its final form. By all accounts, it has a lot of polish, from what was likely several months of extra development and bug testing. The 1996 copyright on the title screen is a testament to this (the "final beta" dates to June 1995). Nintendo did not cancel the game until it was almost finished, and they decided to allow it to go through the full evaluation process anyways. Maybe they thought there would come a time that they could put it out, and over 20 years later that is now a reality. When I originally wrote this article, it was a dark winter in 2010, and I felt that SNES Central was not complete without a thorough article of this game. Over seven years later, I am overjoyed that I can give an update for what I regard as one of the top five Super NES games, with a previously unseen alpha build! Note I am doing this update just before the release of the SNES mini, a followup will come later! By the middle of 1995, it was apparent that despite favourable reviews at the Winter 1995 CES, Nintendo was hesitant to release Star Fox 2 against the superior looking Saturn and PlayStation. The impending launch of the Nintendo 64 also played a part in its cancellation, with Nintendo wanting a clear break between Super FX 3D and N64 3D. Although Nintendo claimed it would be released in the September 1995 issue of Nintendo Power, it was swept under the rug along with other Super FX games like Comanche and FX Fighter. Through the course of time, alpha and near final beta ROM images were leaked. Despite its cancellation, Star Fox 2 remains a highly revered game for its excellent gameplay and intriguing history. 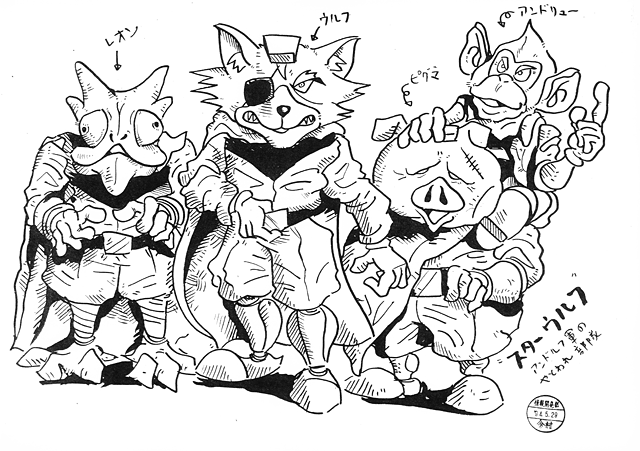 The development of Star Fox 2 began almost immediately after the original was finished. As the above code comment states, Star Fox 2 began development on February 16, 1993, a mere five days before the Japanese release of the original (more on the source code later). The first mention in the press that I found was from the January 1994 issue of Game Players, stating the game would feature split screen multiplayer and use the Super FX2 chip. 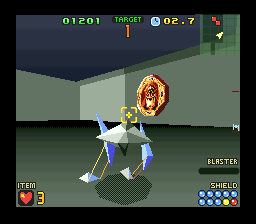 The first public statement on the development of Star Fox 2 was in a rec.games.video.nintendo Usenet post in February 1994 by Dylan Cuthbert stating that it would continue to use polygons (it also mentions Elite's unreleased Super FX game, Powerslide). Aside from that, all mentions of Star Fox 2 in 1994 were generally speculation and rumours. 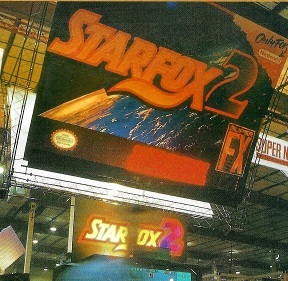 The first display of Star Fox 2 by Nintendo was at the 1995 Winter CES in Las Vegas. With the delay of the then "Ultra 64", Nintendo decided to push several Super FX games (Star Fox 2, FX Fighter, Comanche, all of which were eventually cancelled) along with the unveiling of the Virtual Boy to keep attention focused their way. Really, the Winter CES show was generally a disappointment, as most companies were biding their time until the first E3 that May. It seems appropriate that the biggest games and hardware that Nintendo showed at the WCES were disappointments, second rate fare or never released. However, Star Fox 2 was generally praised by those in attendance, and reports from the CES state that the Star Fox 2 demos were always in use. The reception in the press ranged from glee (Total!, EGM), to derision (Edge). Those who were excited about the game praised the freedom of motion in levels and the new walker mode. Given the response, everything seemed to be set for the promised summer 1995 release of the game. The game was so popular, a man named Shawn J. Freeman was arrested for attempting to steal the game (probably leading to the incorrect assumption that the subsequent leaked ROMs were from the CES show)! Rumors of the demise of Star Fox 2 have been greatly exaggerated. Development of Nintendo's sequel to the hit 3-D space action game is finishing as we go to press. The big question mark is the release date, most likely in the first half of '96. The most recent versions of Star Fox 2 look very sharp and include a much more strategic feel, with radar windows and mother ships where you dock after battle. What happened to Star Fox 2? Why was it cancelled and how far into development was it? How is it, if at all, related to Star Fox 64? The reason for non-release was the then impending Nintendo 64, which of course was intended to be released a lot sooner than it actually was. Miyamoto-san decided he wanted to have a clean break between 3D games on the SNES and 3D games on the new superior 64 bit system. In retrospect, he could have released Star Fox 2 and there would have been over a year and a half before the N64 came out. But hindsight is always 20/20. Star Fox 64 incorporated a lot of the newer ideas we created in Star Fox 2 but it didn't, in my view, take the genre a full step forward. Star Fox 2 really was a different direction of gameplay. Test screen from the "final" beta showing the probable date the ROM was built on. 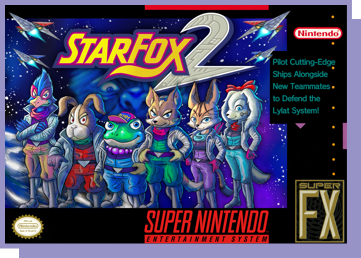 From the timing of the statement in Nintendo, it appears that Star Fox 2 was completed in Summer 1995 (the "final" beta that was leaked has a time stamp of June 22, 1995 inside the test mode menu). Although the impending release of the Nintendo 64 factored into the decision to cancel the game, I'm sure the impressive release of the PlayStation also factored into it. Despite sporting excellent gameplay that outshone most Saturn and PlayStation games released in 1995, the graphics were definitely not impressive in comparison. Mock-up box used by Nintendo for the Winter CES showing of Star Fox and media advertising (originally scanned by Locke Cole from an old EB Games advertisement, and heavily edited by myself). Though Star Fox 2 did not come out, it did influence subsequent Nintendo games. Miyamoto stated many of the ideas and technology for the 3D environment from Super Mario 64 came during the development of Star Fox (and probably Star Fox 2 as well). 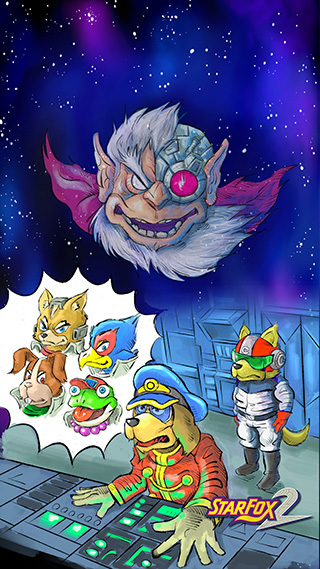 Miyamoto claimed about 30% of the ideas in Star Fox 64 came from Star Fox 2 (in all likelihood referring to the all-range mode battles, Star Wolf team and the tank levels). 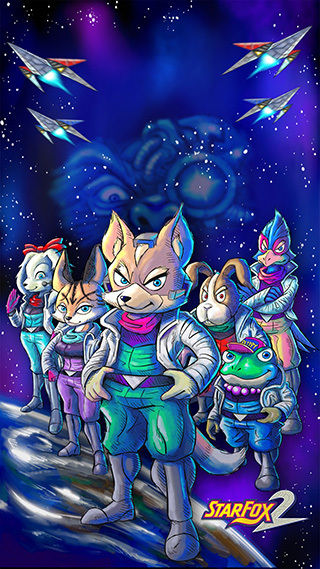 Dylan Cuthbert stated the strategic elements from Star Fox Command for the DS were inspired by Star Fox 2. 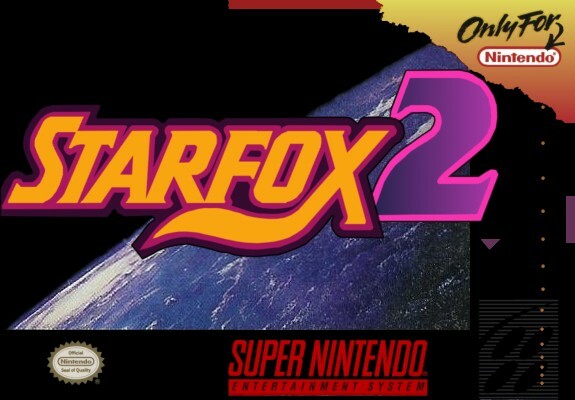 Were it not for the Internet, that might have been the last we heard about Star Fox 2. Though there were still occasional comments about Star Fox 2 on Usenet in 1996 and 1997, it was increasingly clear that Star Fox 2 was not officially coming out. The blossoming SNES emulation scene in the late 90s became an outlet for the proliferation of many unreleased and beta games that would have never seen the light of day. 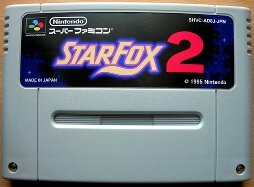 Though website archives at Archive.org are incomplete, I noted that Cherryroms.com (a large SNES ROM site back then) took Star Fox 2 off their "undumped" list between May 1999 and September 1999. This could only mean that the early "multiplayer" alpha leaked sometime between those dates. This alpha certainly piqued the interest of SNES fan-sites such as SNESZone and The SNES Site (an early incarnation of SNES Central, certainly my writing and analysis has improved since then) who produced articles about it. 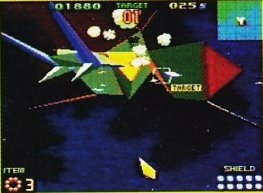 It was clear that this was only an internal development alpha, as even the version of Star Fox 2 shown at the Winter CES was far further along in development than this alpha. The real blockbuster, which served as the pinnacle of the SNES emulation scene, in my opinion, was the release of the final beta of Star Fox 2 in August 2002 (well documented by d4s in this FAQ, who also had a big hand in the discovery of the ROM image). The first screenshots appeared on the now defunct website, sportkompaktwoche.de. The ROM itself needed several fixes (made by The Dumper) before it could play in emulators, though there were accusations that it was a fake before that happened. The unfixed ROM was leaked by "skyhawk" of the German fan translation site, Alemanic Translations. Apparently skyhawk claimed to have found this game on a prototype cart and dumped it himself, probably leading to the widespread belief this game was found off a prototype cart. In reality, Star Fox 2 was leaked as a pure assembled binary from a former developer who wanted the game emulated, and the ROM was not in a proper SNES ROM format initially. There was no source code leaked, nor was there ever a prototype or production cart of it. 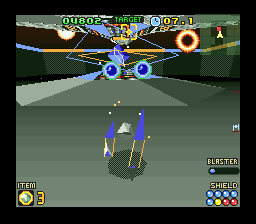 Soon after the leak of Star Fox 2, emulator authors incorporated proper Super FX emulation, allowing the general community to play the game in all its glory. 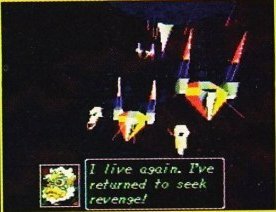 The final part of the Star Fox 2 story is the fan translation. Though it was clear English text versions of this game existed (look at screenshots taken from the game at the Winter 1995 CES), the leaked final beta was entirely in Japanese. In 2004, the hacking/translation team of Gideon Zhi, d4s, Fusoya and satsu from Aeon Genesis translated the game to English, and removed all the debugger information and cheats that were the last remnants of the beta status of the game. Essentially they finished up the game to what the final version might have looked like. The completed translation has become the fodder for many bootleggers making "reproduction" carts that have fooled more than one person into thinking the game actually did come out. I managed to get my hands on some source code for Star Fox 2. I was asked not to distribute the code, and I will respect that. The source code originated from a programmer at a British game company that produced computer games in the early 90s, but worked briefly at Argonaut. There are three archives of the source code, dating from April-May 1994. Star Fox 2 was programmed on an OS/2 operating system. There are not many real goodies of interest to the general reader (it is mostly straight ahead assembly, with few comments). Argonaut used their own custom assembler called ARGASM (yeah). The graphics files are in a customized binary format that I did not feel like attempting to crack. The earliest source archive in this set dates to April 15, 1994. This archive also (to my surprise) contained a ROM in it. After scanning it, it turned out to the early alpha ROM, solving the mystery as to where it came from! There is a lot of legacy code in this archive as well, including some code from a Super NES version of StarGlider (which became Star Fox). The second set of source code dates to May 6, 1994. It has most of the same files as the April 15 archive, but does have added level files, including training levels and one entitled "room". Unfortunately, there weren't any precompiled binaries in this archive. The third archive dates to May 13, 1994. The levels code was pretty much unchanged from the previous archive. There are binary files in this archive, but were not linked together. Thanks to skilled hacker, Luigiblood, and the fact that one of the archives contained the the Super FX assembler, it is now possible to play the version from the previously uncompiled archives. Luigiblood was able to write a linker from scratch, and confirmed that it was working properly by matching pre-compiled binary in the April 15 archive. AS previously inferred, the May 6 and May 13 archives produce a near identical binary, but both are significantly different from the April 15th one. 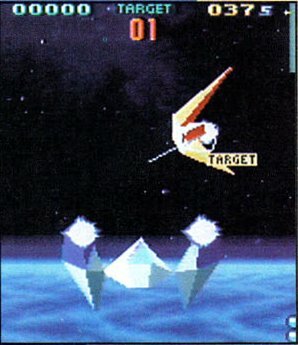 At this point, there are four known leaked prototypes of Star Fox 2: three from the source code archives mentioned above, and the "final beta". There were plenty of mentions about a third, even earlier alpha, even referenced on the old version of this page. However after analysis, the really early alpha turned out to be a demo of the Game Boy game, X. In addition, there are three prototype version of the game shown to the media, one was from a preview in Nintendo Power, one from a Brazilian game magazine, and a version shown at the 1995 Winter CES. The "early alpha" originated from the source code mentioned earlier (as a file called SF.ROM). There is no record of when it originally leaked on the Internet, but looking at FAQs from Cherryroms.com, it must have been leaked sometime between May and September 1999. The ROM itself is rather buggy, and flickers on real hardware (if this video is actually being played on real hardware). If you want to play this game with minimal problems, I suggest using a recent version of Higan, which allows you to run it with proper cartridge mapping (use the included manifest.bml file). It might take a few resets to get it to run, which may be because the game doesn't properly initialize the RAM. Despite the alpha feel to this build (once you win a level, the game basically freezes and you have to reset), the 3D navigational aspects of this game are certainly approaching completion. 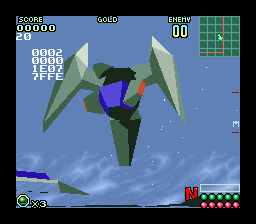 The Arwing also is able to transform into a walker in land-based levels (which is in the final version), and this "hover" style craft in space-based levels. The hover mode never made it into the final version, probably because it is a bit difficult to control. Many of the land-based levels have N-E-S-W markers so you can tell what direction you are going. All the enemies and objects in the level (except bosses that show up) are bounded to a square area on the radar screen, though you can keep going outside of this boundary. If you go far enough, you loop around to the other side. 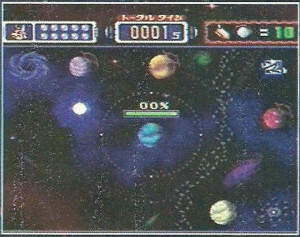 The control scheme is the same as in the first Star Fox game (they switched the fire button from "Y" to "B" in the final version). Also notable is that acceleration/braking causes your ship to overheat for a short while if you hit the limit of the bar. The programming for the walker does not seem complete, as it moves very slowly. The music is very nice, but I did not immediately recognize any of the songs being in either Star Fox or the final beta of Star Fox 2. STG3-Magma: The background is the same as in the Ground Level. 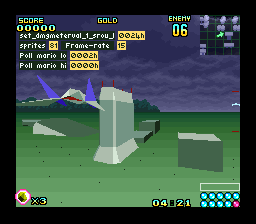 Again, another Arwing starts off with you at the beginning of the level (if you shoot it down, the level ends). There is a single enemy on a raised platform, if defeated it brings the Space Blade. STG4-Park: The background is the same as in the Ground level. Lots of four legged insectoid enemies, and robots that don't move. After a while, the Space Blade boss comes. STG5-Sun: Different music than the first four levels, with multiple rocket ships. Destroy one and the Mirage Dragon comes. Very impressive background. STG6-Sea: Different music yet again. There are a bunch of rings you can fly through, several birdlike enemies and rocket ships. Destroy an enemy and the Mirage Dragon comes. EXT1-Senkan: Space level with lots of enemies. The game and sometimes zsnes crashes hard when you hit an enemy. EXT2-Asteroid: Lots of regularly spaced cubes (asteroids?) floating around. Again, the game crashes if you hit something. Another Arwing starts the level with you. EXT3-Hidora: Another space level, but is very similar to the Park level in terms of enemies. There are these strange flaming head enemies. Defeat the enemies and the Mirage Dragon comes. 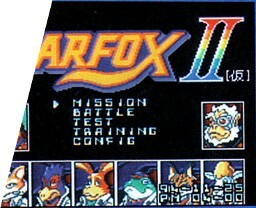 In the two player battle mode, you have the choice between six characters: Fox, Slippy, Peppy, Falco, Andross and a female (?) fox character. There are five levels: two ground, two space and marine. The radar has a white marker where your opponent is. Once one person is defeated, the winning ship flies off, and you must reset. The multiplayer mode actually works quite well, with no slowdown, although it is easy to see that it could be pretty boring after a few attempts. The test mode has five levels, plus an option to choose from various different programmers (maybe to write who did the test in the debugger?) The marine stage allows your walker to go into a "swimming" mode, though you can only go upwards. The levels are empty except for rings. There are Ground, Desert, Marine and Space levels, and you can choose one or two player modes. There are two modes in training: type and train. The "type" mode is a single screen thing that might be an explanation screen for various parts of the game. 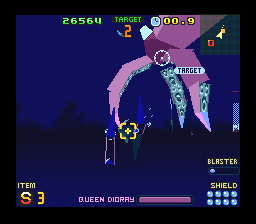 The Arwing flies in a dark screen where random ostrich enemies appear and can be shot. The "train" mode shows the ground level, with an explanation of the controls on screen, plus the alphabet and numbers on the right side, which I can only assume are filler for future content. Finally, the config mode has options for stereo and mono sound, plus a sound test (which doesn't appear to work). Not much else to say about that. In summary, the alpha appears to have most of the game engine for Star Fox 2 finished, but the levels and enemies are in a very early state. There was no programming to return the player to the menu after defeating the bosses and debugger information is displayed while playing. The two player battle mode works quite well and has a fox character that is not in the final beta. Luigiblood was able to assemble the source code of a build dating to May 6, 1994. Alas, it this build is far less interesting than the April 15th build, with empty levels, no sound (except when you play through one round of multiplayer), and the co-op mode seemingly removed. The map screen now shows some planets. There are a lot of bug fixes in this build, which results in a lot less crashing problems in the main levels. The multiplayer mode is fully functional as well. If you go out of bounds, it gives a warning sound and the screen goes dark. There is no consequence to that, though. The level selection is the same as in the previous build, but the backgrounds and level layouts are a lot different, and fewer (or no) enemies. Planets added to the map screen The Sun level. Most levels are pretty sparse in this build. The May 13, 1994 build is visually identical to the May 6 build, except for one thing. On the STG1 - Ground level, it appears that the draw distance it a little bit worse (but maybe my eyes are deceiving me and it is just a timing difference). I guess they were experimenting. 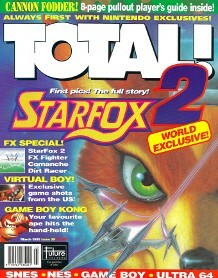 Nintendo Power had an "exclusive" preview of Star Fox 2 in their February 1994 issue. It is far more advanced in development than the alpha ROM. In this version, there is a very plain, almost squared off map. The third transformation of the Arwing still exists in this beta. The game appears to have a lot of polish at this point. 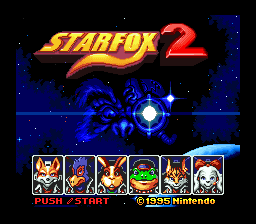 The start menu screen is different than the CES beta with the game titled "Star Fox II" and displays Andross and a goat/sheep character that is not in the final version. 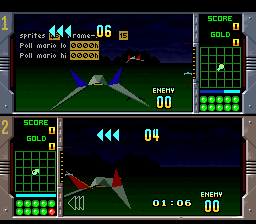 Map screen varies significantly from the final version Third transformation of the Arwing that was later removed. 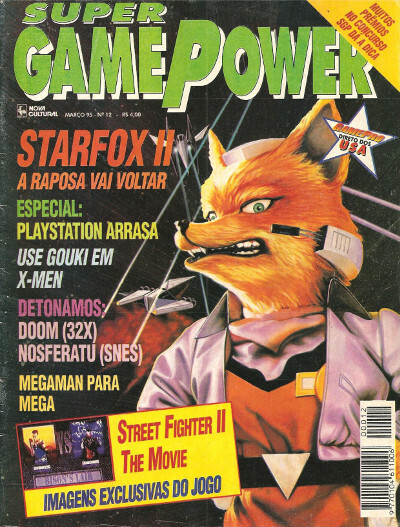 Star Fox 2 made it on to the cover of the March 1995 issue of the Brazilian game magazine Super Game Power (essentially the Brazilian version of Gamepro). Despite the fact the game was not complete, they gave it a full review (scoring it a 4.8 our of 5). I believe this build is intermediate of the November 25, 1994 beta and the version shown at Winter CES. 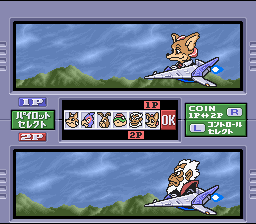 The map screen appears to be different from both versions (notably Corneria is in the center, not the bottom left), and the character portraits for Miyu and the goat/sheep character are different. The language in this build is set to Japanese. 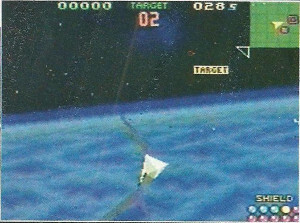 This beta was shown at the 1995 Winter CES in January 1995, and was the centrepiece of Nintendo's display since the "Ultra 64" was only shown behind closed doors. Most descriptions of the WCES event say that the Star Fox 2 units were always busy. The beta was impressive enough to make the cover of Total! magazine in the UK (with a nice description of the display at the WCES), and a multi-page preview in Electronic Gaming Monthly (which has more pictures than any other magazine). Several shots found in magazines are the same, so I assume that these come from a media package distributed by Nintendo at the WCES. From the looks of the pictures, the gameplay engine was complete by this point. The interface of the game is not much different from the final beta. One thing of note is that the CES beta has English text. The characters in the WCES beta appear to be finalized, though the title screen uses different artwork from the final beta. Notably, the goat/sheep character has been replaced by Fay. The title screen also indicates a change from Roman to Arabic numerals for the title. The WCES beta had a different map screen than the 94-11-25 beta, and lacks the Macbeth and Fortuna levels that are in the final version. The map icons for enemy types also differ from the the final beta. It also looks like the space battle scenes are in a third person view, rather than a first person view like in the final beta. 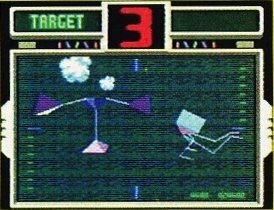 The introductory screen for levels shows that the targets to open up the base differed in the WCES beta and the level layouts were not the same. I did not see any screenshots of the "hover" transformation of the Arwing, indicating it might have been cut by the WCES. Overall, the game seemed to be coming together by the Winter CES showing, and mostly just needed additional levels to complete development. The map screen shows fewer levels and different graphics from the final version The targets for planet levels differed in the WCES beta compared to the final one. June 22, 1995 - "Final Beta"
The so called "final beta" of Star Fox 2 is the culmination of a nearly two and a half year development process to take the game from an on-the-rails shooter to a fully 3D experience. The game is close to its final state, in that it is playable to the end with few game breaking bugs. The framerate counter, several debugger modes, and some hard coded cheats indicate that this was not the final production version. According to Dylan Cuthbert, some gameplay features, like randomness in enemy formations and other strategic gameplay that are in the final version have not been implemented in this version. Despite what others say, I disagree with people saying that it was a "final" beta. This game had a few levels in the story mode that took place in space, but due to a particularly annoying bug, proceeding very far in the game is very difficult. The bug makes it so that Star Wolf characters attack you at every small movement on the map, but you can't actually attack them unless you are very close to their ship on the map (and often you aren't). Also, when you are fighting in levels, quite often your ship disappears and the camera freezes in place, making you have to reset the game. Also, there is test levels for using a Star Wars-like walker, but in general, these stages are quite buggy and the game randomly crashes. I seriously doubt these bugs are from the lack of Super FX emulation. To me, it seems like the game engine for the free-range mode stages was complete, but the walker stages were not. If you ask me, this beta stands as a 75% complete game at best. I will try it again once the next version of Zsnes comes out and see if any of these bugs were fixed. Final beta in test mode. Note the framerate and sprite counters. Of course, I was completely wrong in my assessment, and I eventually had to eat crow. 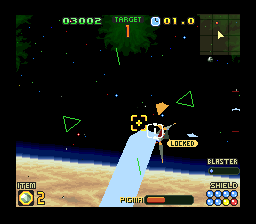 Once the emulation bugs were fixed, Star Fox 2 became completely playable with few bugs. It is true that the levels in the debugger modes are glitchy and prone to crashing, however these have no bearing on the mission modes. Speaking of the test modes, there are a few things in the menu of this build that should be noted. 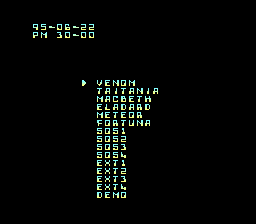 The "Test" menu brings you to a selection of levels, some of which are obviously not in the final mission mode. 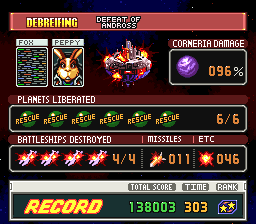 The planetary and battleship missions tend to have no real ending when you defeat the core of the base (you can crash into the core to kill yourself). There were a couple of Andross battle modes. I found after beating one of the Andross levels that the sound started to glitch (it just kept repeating samples of the characters talking at the end). Also, your health doesn't replenish between levels, so if you die in one, you are left with no health in the next test level. Before starting each test level, there is a "planet step", which can be set to different numbers to take you to different parts of the stage. Your Arwing is orange coloured in the test modes, and the character you use seems to be be random. 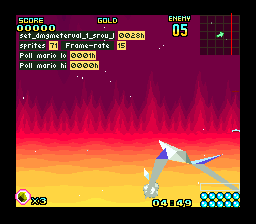 The Practise mode seems to just be the "easy" mode, except Corneria doesn't take damage, you have two Fox Arwings, and they are coloured orange. There seems to be little else different, as the scores in the training mode and the General Pepper coins are saved in the records. The config mode allows you to change the sound from stereo to mono, and also has a sound test. In the main game, there is a cheat that makes it so Corneria does not take damage, making the game rather lacking in challenge. The fan translation spruces up the logo. 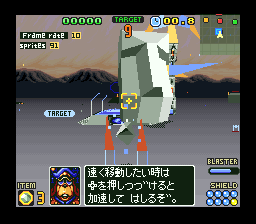 Thanks to the efforts of Aeon Genesis, the June 22, 1995 build of Star Fox 2 was fully translated to English and the last of the bugs/cheats (i.e. 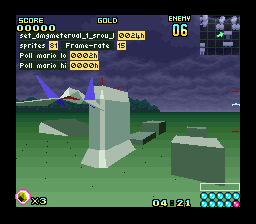 the bug where the Arwing can transform in space levels and Corneria not getting damage when attacked) were fixed. The translation patch came out on October 17, 2004, over two years after the beta was leaked onto the Internet. Even at that point emulators had trouble running the game, though it appears that zsnes 1.40 came out a couple of months later with support. 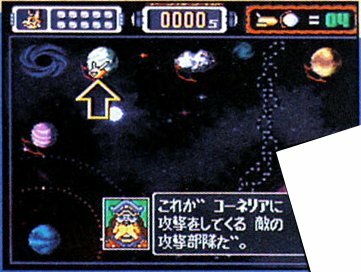 I'll admit that I never got around to playing the patch until I started the article, which probably is why I never updated this page for years and incorrect information was allowed to perpetuate (many of the pieces of incorrect information on the Wikipedia page for Star Fox 2 appear to have come from the old article). I think the translation is excellent, though admittedly Star Fox 2 is not the most story driven game. The patch gives the game a nice bit of polish to make it look like it would have if it was released. 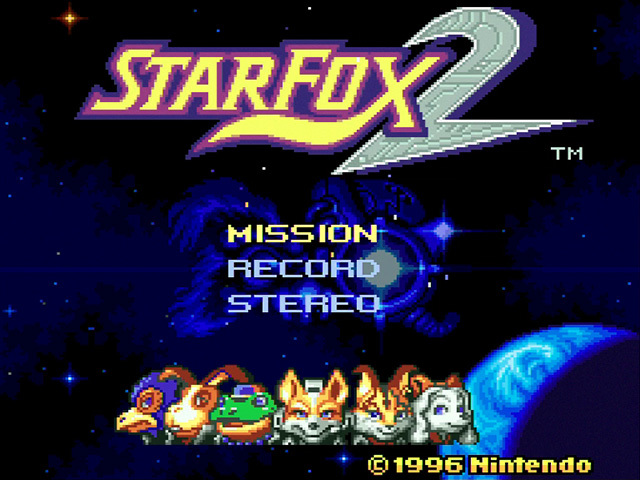 Star Fox 2 is an excellent game, and I consider it to be in my top 10 favourite SNES games. This game corrects pretty much all of the complaints from the first game (lack of range of motion, poor frame rate, lack of aiming cursor), and upped the intensity level. Though some might be disappointed they cut the two player multiplayer mode (which existed in the Winter CES beta), the excellent single player mode more than makes up for it. Star Fox 2 is more than just a straight ahead shooter like its predecessor. 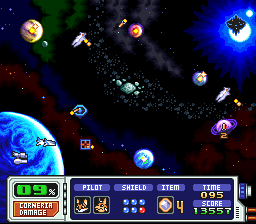 The game runs in a semi-real time mode, with the forces of Andross closing in to destroy the planet of Corneria. Your force (two Arwings that can be changed at any point on the map screen) flies around the map, while you encounter ships, rockets and planets that are occupied by Andross. The game is split up into three difficulty levels. 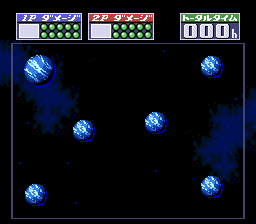 Rather than just increasing the amount or hit points of enemies when increasing the difficulty levels, the amount of planets needed to be rescued also increases, and the level layouts become more complex. On "normal" difficulty, only two planets need to be saved, two battleships need destroyed, and the levels are very straight forward. 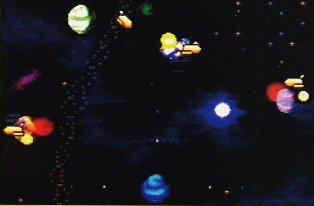 In "Expert" difficulty, six planets need saved, four battleships need destroyed, and the levels are complex and have bosses in them. I found the "normal" and "hard" modes were fairly easy to beat, and I passed them first try. On "expert", it really becomes crucial to manage the assault on Corneria and beat levels quickly or the planet quickly takes too much damage. Since the Mothership can heal your ships, the main challenge is protecting the planet. 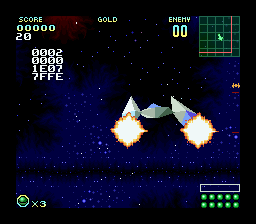 The battles in Star Fox 2 are split between first person sections in space and third person planetary and battleship levels. The space sections have you doing dog fights against other ships (including the rival Star Wolf gang). 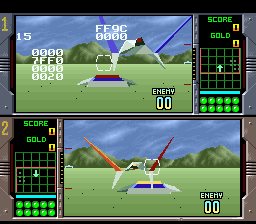 The planet and battleship levels allow you to switch between the Arwing and walker modes on the fly. On planets, you have to step on trigger switches to raise the base from the ground. Once inside the base or battleship, you usually have to solve a maze or defeat a boss to gain access to the energy core. Thankfully, they added a cross-hair to make aiming more precise and the ability to lock on and shoot a charged energy blast at enemies. Character selection is key to success in this game. Each character has strengths and weaknesses, making it key to pick a character that suits your playing style. For instance, Slippy and Peppy's Arwings are tanks that can take more hits than any other character, but have a much longer charge time for the energy blast and are slow moving. Miyu and Fay are the opposite; they have the weakest Arwing but can shoot off several charged blasts in the time it would take for Slippy and Peppy to shoot one. They also start with the twin lasers making them and offensive powerhouses from the get go. Falco and Fox have statistics between these extremes. Walker mode with a General Pepper medallion. Now for the nitpicking section. The game has great graphics for a Super FX game. The obstacles in planet levels have textures on them, and the backgrounds are detailed. A nice added touch in the space levels are that the backgrounds reflect the location on the map where you fight the enemy. The framerate is better than in Star Fox, though it does tend to slow down if there is a lot of action on screen. The music is top notch, as you might expect from a Nintendo developed game. The control scheme rotated the face buttons by a quarter turn counterclockwise from the first game. 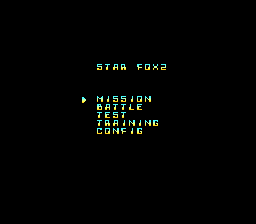 The only complaints I have about the controls are that the cross-hair doesn't automatically reset to the centre of the screen in first person levels, leading to a bit of frustration in Star Wolf battles. Additionally, turning the walker is a bit slow, though this is likely dictated by the frame rate. 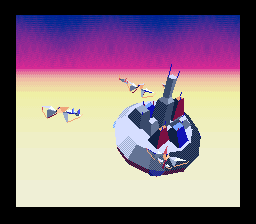 Overall, the final beta of Star Fox 2 is a lot of fun. I found the dogfight battles to be very intense and exciting. The expert mode takes about an hour to pass. The main replay value comes in trying to get higher scores. Additionally, there are General Pepper medallions in all the levels that you can search out. Once collected, they do not appear in future playthroughs. Space battles are done in a first person view. Here, battling Pigma over Titania In each planetary base and battleship, there is a core that needs to get destroyed. On September 29, 2017, the final version of Star Fox 2 will at last be available for all to play. Nintendo has gone at great lengths to promote this, even including concept art and a mockup of the SNES manual on their online instruction manual. The 1996 copyright on the screen indicates that there might have been quite a bit of a gap between the June 22 1995 build and what is the true final version. Nintendo even brought back the original designer (Takaya Imamura) to do the promo artwork for the game. As I release this updated article, it is still one week before the SNES mini comes out. I anxiously await getting my copy so that I can finally play the final version of one of my favourite games. Once I give it a good playthrough, I will be updating this once again!